This resource is part of a larger collection of indoor activities (see http://www.carboeurope.org/education/indoorhands.php) that explores the relationship of the chemistry, physics, and biology of carbon dioxide to climate change. Some of these activities could be combined for a unit on carbon dioxide and climate change. If seawater is not available, mix it yourself by adding 35 grams of salt per liter of water. Extensions and variations are described in the text. The focus of this resource is on the impact of salinity in seawater on the water chemistry when CO2 levels increase in the air above it. There is no attempt to link this to the increase in atmospheric carbon dioxide but this activity is a natural complement to CLEAN selected resources on ocean acidification. 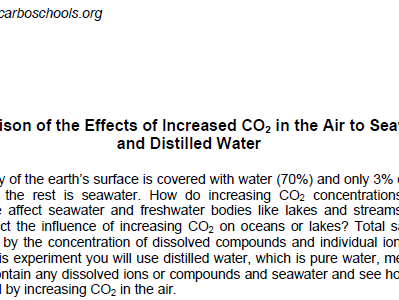 Comments from expert scientist: This demonstration clearly shows relative effects of CO2 on the pH of seawater and fresh water, and the exercise can be undertaken by middle school (and above) classrooms with relative ease. From an observational standpoint, the children should be able to grasp concepts of importance. This is a simple experiment that makes its point directly without clutter. Well-described activity with a good experimental set-up and graphs of previous runs of this experiment for guidance. Assembling the equipment may prove more interesting to the students than the collecting and plotting of the actual data. The teacher notes provide answers to the student questions and alternatives ways of presenting the data. There are suggestions for further experiments. Well-described experimental set-up with plenty of sketches and photos that help with using this activity in the classroom. Description includes photos and diagrams of the setup and charts of possible datasets.